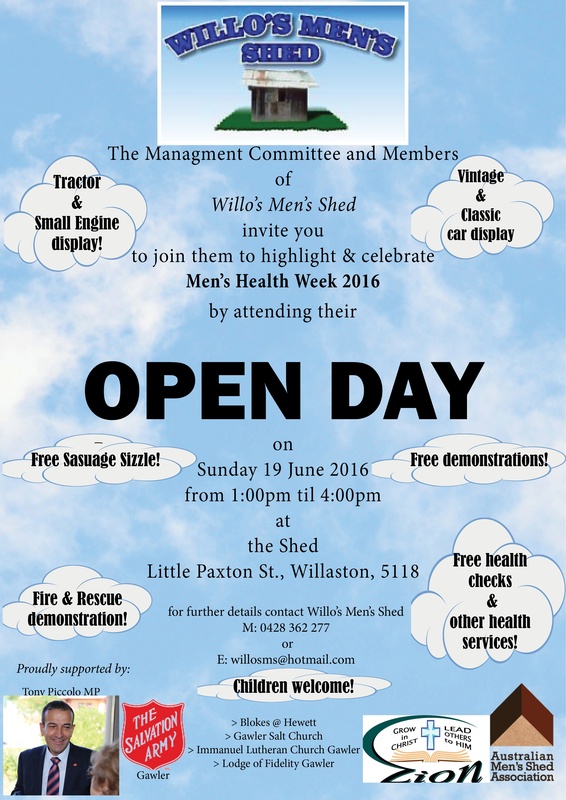 Willo’s Men’s Shed Open Day – Sun June 19, 2016 Willaston. The Willo’s Men’s Shed (Gawler, South Australia) will be hosting an Open Day and Mini Expo on Sunday June 19. The event is proudly supported by Tony Piccolo MP, Member for Light and Patron of the FFCMH. The Open Day and Mini Expo is the main event in Gawler to promote the health needs of men during Men’s Health Week 2016. For further information, including a wish to be a participate at the Open Day/Mini Expo, please contact Willo’s Men’s Shed direct on M: 0428 362 277. You are most welcome to attend the event, or if you can’t, please pass this flyer to other men in your community. This entry was posted in Events, News and tagged event, men's health week, men's shed. Bookmark the permalink.